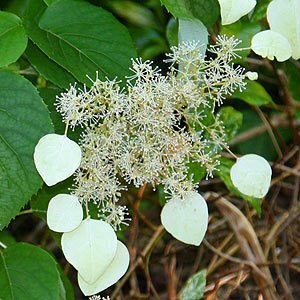 Often referred to as a climbing hydrangea, Schizophragma hydrangoides is a deciduous vine that clings to walls, tree trunks and other structures. Often called the Japanese Hydrangea vine it is a relative to hydrangeas and does grow in similar conditions. The little adhesive ‘aerial roots’ will attach to most surfaces and it clings closely to the surface. Attractive heart shaped green foliage and lace cap type hydrangea flowers in spring to early summer. Schizophragma hydrangoides can take a few years to flower, and it seems the more sun they get when young the quicker they will come into flower, after they flower for the first few times the sun is not that important. Flowers are produced on offset branches. Used in gardens to scramble over tree trunks, walls and fences over time Schizophragma hydrangoides will reach to 7 – 10m depending on conditions. 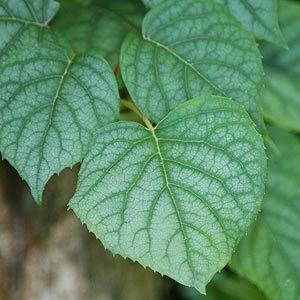 The popular cultivar ‘Moonlight’ with its silvery green heart shaped leaves is widely grown. Best grown in dappled shade in a humus rich moist but well drained soil. Schizophragma hydrangoides will need something to ‘cling to’ and be a little patient as young plants can be a little slow to get going. Propagation is from softwood cuttings taken in early summer or from semi hardened wood in autumn.